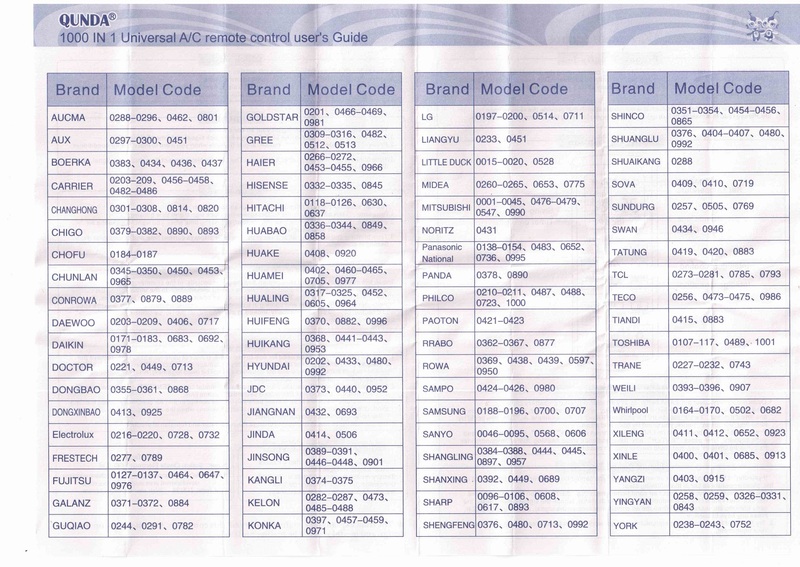 I bought one of these univeral air-conditioner remote controls on ebay, and a year later I couldn’t find the manual. I searched online and it wasn’t on the manufacturer’s webpage or anywhere else. 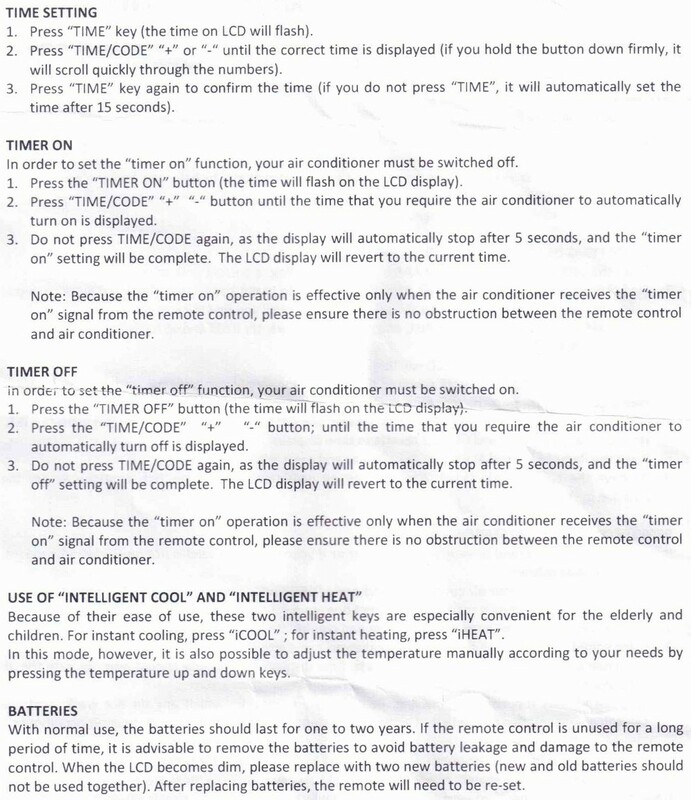 Eventually I found my copy of the user manual and the code to enter for my Samsung air conditioner. So I scanned in the user manual and the extra pages and have uploaded it here in case I ever need to find it again, and in case there are other people out there in the same situation. Have set this up with code & A/C works however will not let me change the Mode or temperature. Any instructions to get these to change??? Hi, does anybody know the code for an Airwell Air con? This was so useful and helpful -thank you for sharing the manual! 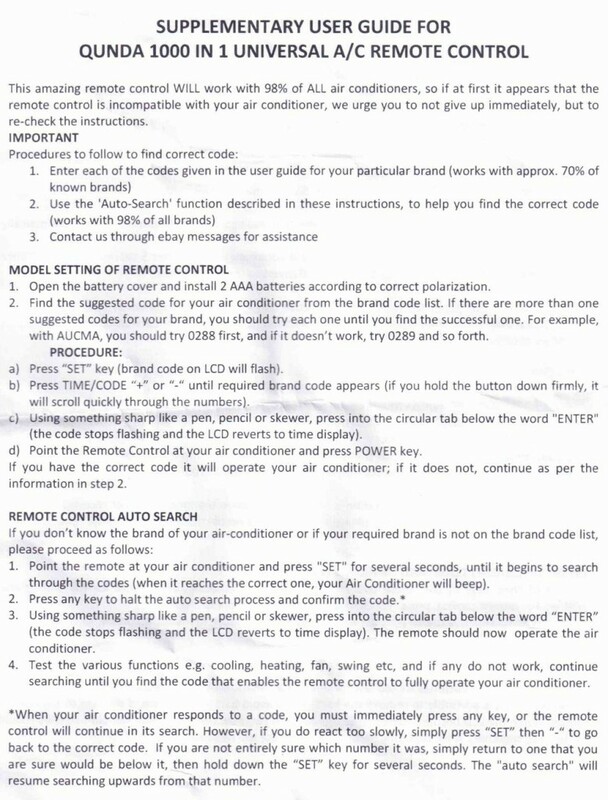 Arcool my airconditioner help code? how does the iheat work?should the temp be on 20 or 30? like for cooling we go down,in heat should we go up..as in 27 or 30? I am looking for a remote for FRIMEC Air conditioner. And I don’t see its code. Can any one help? U set it at auto and then follow the instructions as guided ….mine code was also not in the list I did the same. Does anyone know the breezair code, please. Thank you so much for this information. My Conia air-con works now on the auto search function. 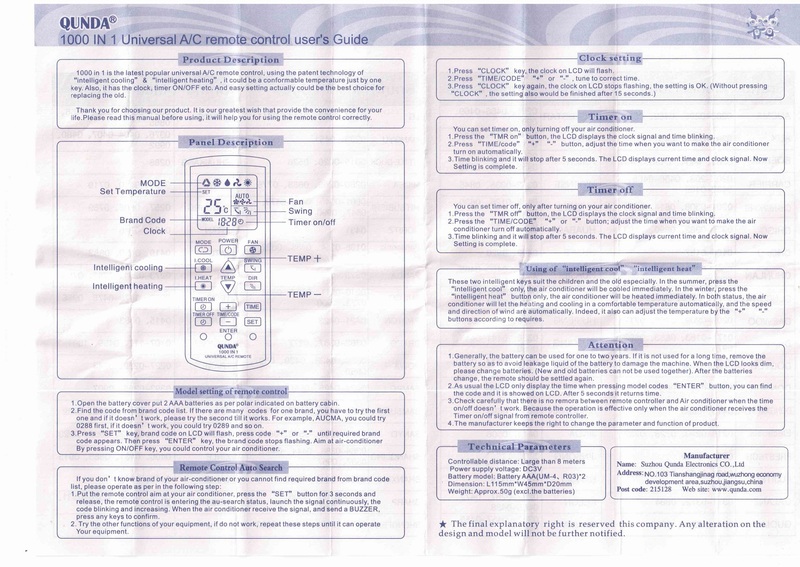 there is also an auto setup guide on the back of the unit, if yours is not readable, it says to turn on AC manually, point the remote at it, press the SET button, if the AC doesn’t turn off do it again. when the AC turns off, press the OK button. Vestar ac model code please? Thank you so much, saved a huge drama for me. My remote had “forgotten” the aircon after a long period of not being used. Thanks for being kind & thoughtful. You have done great help to others. God bless you. Do you know how can I switch from Fahrenheit to Celsius? Its functional in my dawlance ac but as soon as i press button from the qunda remote the display is gone off on the ac..
Any one know Corona code? did u fig it out?? ?how does the iheat work?should the temp be on 20 or 30? like for cooling we go down,in heat should we go up..as in 27 or 30? Can someone please tell me the effect of each ‘mode’ on the remote control? Thanks. When I use this remote on our air-conditioner the mode button cycles through different modes – like fan only, cool, dehumidify, heat, etc. Hope that helps. If u use brand morgan ,u can use 439 as an alternative code..it works for me.. Sorry, I don’t sell this – I bought one and lost the manual. I couldn’t find this manual anywhere online so when I found my paper copy again, knowing I would loose it again soon I scanned it and put it online. thanks. looked everywhere for this.